Today I join Mimi Lenox and many other bloggers in the 6th Blog Blast for Peace ... and invite YOU to join the wave today on your Blog. Just click Mimi's link and read the directions for getting your own Peace Globe to personalize and publish. Then follow the directions to share with others through her official sites ... and visit others blogging for peace. the 6th Blog Blast for Peace! Fingers crossed that Peace breaks out worldwide soon! This is my first Peace stop! Three wonderful globes, but I especially love your peace collage! Well done! 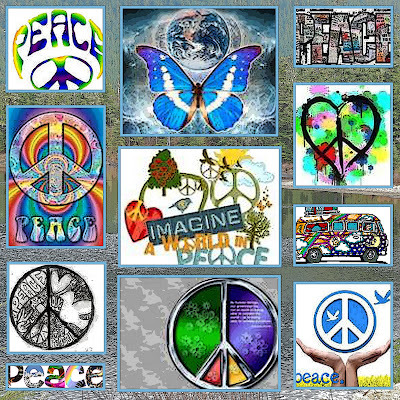 Thanks for dropping by my site... i love your peace mosaic!!! Peace!!!! Thank you for visitng my Peace blog ~ it's the first time I've ever joined in and it seems a wonderful thing to participate in. I love your mosaic. Peace. I love your mosaic and peace globe. Peace! I love that poster of peace signs! Happy Blogblast to you! Peace brings so much beauty! That mosaic is really nice. A wonderful sentiment. I love the images in the mosaic, too. Beautiful Peace Globe and the Mosaic is just amazing! Beautiful Blog Blast for Peace! 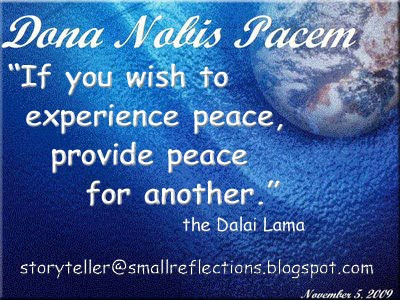 The Dalai Llama quote is perfect as is your final quote, lovely Peace mosaic! Wonderful! I used my globe to speak for the animals that suffer because of human wars. The Dalai Lama is a favorite of mine. I love your peace globe and the mosaic is amazing. Peace to you and yours. Great graphics for this BlogBlast for peace! The collage takes me back to those wanna be hippie days of my youth when peace and love were what mattered and still does. Hi Storyteller! Thank you for this post. The collage is very beautiful! Thanks for your visit! I went to read Mimi's post for the Blast of Peace. I wish I am feeling well then I could have some strength to think well what to write as I have plenty of pictures in that theme to be shared. Lovely cause to share around the globe. Even in our interaction with fellow bloggers in itself promotes Peace through friendship and fellowship with like mind focusing on Peace for the World. Thank you very much Madam for this yet another good post coming from you. Your peace posts are always inspiring. Every year you do so much to spread the cause of peace on BlogBlast Day. Lovely globes on all three sites. Just outstanding. You are #1517 in the Official Peace Globe Gallery.